While sitting in Islamabad on September 30th, I received a call from a friend who said that the 19th summit of the South Asian Association for Regional Cooperation (SAARC) to be held in Islamabad from November 9th-10th, 2016 had been ‘cancelled’ because India has pulled out, and that such will be all over the media soon. “Modi is so predictable”, I thought to myself as I thanked my friend and hung up the phone to start flipping through Indian and Pakistani TV networks, scrolling through the online Twitter feed from the news outlets of member states, and looking at official press releases. It wasn’t unexpected at all for me to see India, along with the member countries like Bangladesh, Bhutan and Afghanistan, which are economically dependent on and militarily weaker than India, sabotage the summit in Islamabad by not participating. Instead, I was expecting this to happen ever since Pakistan pushed for fully-fledged SAARC membership for Beijing at the 18th SAARC summit held in Katmandu. The damage is done, I concluded. Influence: China is the world’s second largest economy poised to be the largest by the end of the decade and is a growing military power. Thus it is no surprise that it wants to greatly expand its geopolitical and strategic influence in regions closely connected to its borders, including South Asia, a region which is underdeveloped, densely populated, strategically located, nuclear armed, politically unstable, offers China a gateway to the Indian Ocean Region (IOR), and is looking to diversify its own strategic and geopolitical scope to avert Indian designs for economic and strategic hegemony in the SAARC region. “If China becomes a member of SAARC it may be able to bring economic development to other members of and may also add to the one belt one road initiative,” Director General of the South Asian Strategic Stability Institute (SASSI) Dr. Maria Sultan told me in Islamabad when I requested her to comment. So where better to start for Beijing in South Asia than SAARC? That is exactly why China, which already had observer status within the organization since 2005, wants full membership in SAARC with the help of its close partners like Pakistan, Nepal, and Sri Lanka, through a proposal that was pitched at the 18th SAARC Summit in Katmandu by Pakistan. Stability: If China is to fulfill its goal of a “peaceful rise” to the status of a super power, it must ensure that the nations which form its immediate neighborhood are politically and economically stable. The “One Belt, One Road” (OBOR) initiative which includes the pivotal $51.5 billion dollar China – Pakistan Economic Corridor (CPEC) and Chinese port projects with Myanmar, Bangladesh, Maldives, Sri Lanka, and Pakistan are part of a greater strategy for Beijing to cultivate stable alliances with its neighbors while it secures its own vital economic interests like energy security and access to the critically important Indian Ocean Region (IOR). “Chinese imports from Pakistan, Bangladesh and Myanmar will fetch much needed revenue for these smaller economies, therefore logistical integration is expected to benefit all countries involved,” Makhdoom Qaiser Basheer, who is a PhD candidate in international relations and heads the Times of Islamabad newspaper, remarked. This strategy also includes a Military dimension, as China is working on cultivating strong military partnership with Pakistan, a partnership which has only increased its strategic value after the Indo-US Logistics Exchange Memorandum of Agreement (LEMOA) to counter the hubris driven strategy of the Indo-US nexus to hegemonize the Indian Ocean Region by propping up India as the sole power in return for supplementing US interests. “China already has a major commercial and military presence in nations around India. Its investment in Pakistan through CPEC mechanisms also could reap huge economic benefits for Pakistan, allowing the country to prosper and strengthen its regional position especially with major ports such as Gwadar,” Omar Mohamed, a Bahrain-based security and geopolitical analyst with ‘DERASAT’ Think Tank, stated when I asked about Chinese strategy in the SAARC region. Dominance: India is the single biggest economy, most populous country, and the most powerful military in South Asia. Thus, according to the self-inflicted Hindutva inspired logic of the New Delhi deep state, such attributes must automatically translate into India’s total economic, strategic, and military hegemony over South Asia and the Indian Ocean region. Starting from 1947, when the British Empire faded out of the subcontinent, India has invaded and occupied a number of sovereign ‘princely states’ i.e. the State of Hyderabad, the State of Kashmir, Jammu and the autonomous region of Goa. In its quest for total hegemony, India has fought 4 wars and conflicts with Pakistan, including its invasion of East Pakistan in 1971 which created the new state of Bangladesh that the Indian deep state thought would become an Indian vassal state. The creation of LTTE in Sri Lanka, providing military backing to the Northern Alliance fighters in Afghanistan during the Afghan civil war, aiding and abetting the Baloch insurgents groups in Balochistan, the anti-China East Turkistan Islamic Movement (ETIM), and most importantly, supporting the terrorist network of Tehreek-e-Taliban Pakistan (TTP), are a few of the examples of the Indian hybrid warfare strategy against its smaller neighbors. 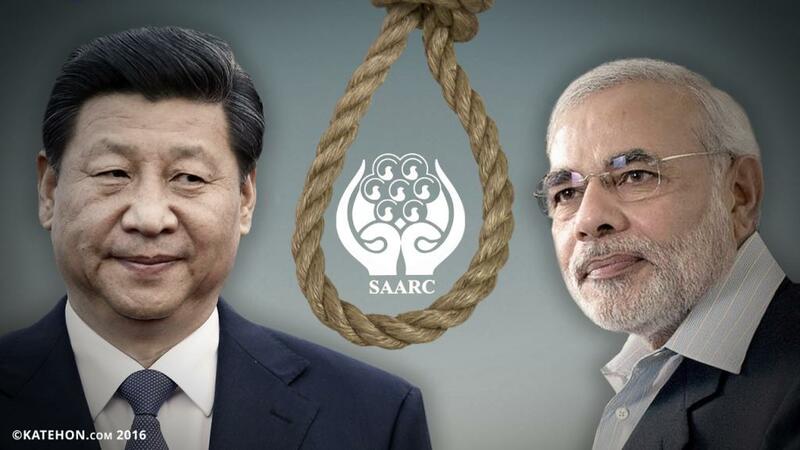 Keeping China out of SAARC: Given the history of the Indian deep state’s hubris-driven activities in South Asia, it was no surprise to see Indian opposition to Chinese membership in SAARC at Katmandu summit. The Indian pundits started to push for creating a hostile environment with Pakistan to undermine the upcoming summit in Islamabad, where Pakistan was expected to repeat its demand that Beijing be granted full membership in SAARC. The Indian deep state successfully orchestrated a hostile climate at the line of control in the disputed Kashmir region, which was augmented by a sophisticated information warfare campaign and a willingly agenda-driven and increasingly nationalistic Indian media intended to amplify its impact on Indian public perception. “The Indian media has rarely gone against the policies of the “South Block” while being critical about domestic issues. The Indian media has used SAARC to drum up propaganda about its economic and societal potential while marginalizing the need for conflict resolution, a goal shared by the Western powers such as the US, UK and France,” said Naveed Ahmed, a Doha-based expert with Al-Jazeera. Balance of Power: In the current South Asia theater, Pakistan, enabled by its prime geographical position, sees itself as a regional power that seeks to bring and maintain a balance of power in the region by brokering and balancing the power dynamics with and between bigger powers like China, Russia, the United States, and regional powers like Iran, the Gulf Cooperation Council states, and India. This strategy is best exemplified by the $51 billion dollar China-Pakistan Economic Corridor (CPEC) project which has been made open for all regional countries, including India, although the current Hindutva government in India led by Narendra Modi has decided to pass on the opportunity and has instead decided to seek to destabilize the project. In line with this strategic vision, Pakistan sought to support Chinese membership in SAARC, because India has utterly failed to fund the infrastructure needed to connect the member states through roads and railway infrastructure. In Pakistan’s understanding, Chinese membership can open the gates for Chinese investment into SAARC modeled after the CPEC project, which would turn SAARC into an economically integrated, viable, and equitable organization, as opposed to its current state as an absolutely failed and utterly dysfunctional organization that is only being manipulated by India for its perceived hubris-driven strategic objectives in the region. In other words, the camp of SAARC member states led by India which boycotted the summit have only sought to undo the organization itself by rejecting the potential Chinese investment which would have accompanied China’s SAARC membership. Military Balance: Pakistan is fully aware of and concerned by the Indo-US objectives aimed at domesticating the Indian Ocean region under the China containment strategy, because this also threatens Pakistan’s own interests. It is therefore likely that as the level of threat increases, Pakistan will allow an increasing Chinese military footprint to rotate from its military bases in Karachi, Ormara, and potentially Gwadar. Bilal Khan from Quwa, a Canada-based military think thank, has commented:“If protecting the trade along Pakistan’s Sea Lines of Communications (SLOC) is a goal, then a relatively strong Chinese surface fleet could be anticipated. That would imbue the region with another major power capable of both region-wide air defense and long-range surface strikes, a capability that only the Indian Navy enjoys at this time”. This will be needed to ensure that the Indian Navy doesn’t enjoy an uncontested control over the Indian Ocean Region. “The CPEC project is going to require deeper military cooperation between Pakistan and China in the Indian Ocean region. The counter strategy will involve creating a naval balance of power to protect mutual economic interests, energy security, and the ability to project power, especially in strategic chokepoints like the Strait of Hormuz and the strait of Malacca,” Lt. General Ghulam Mustafa, the former head of Pakistan’s Strategic Planning Division, said. Now that India has officially killed SAARC, the intelligentsia in Islamabad and Beijing have put their heads together to come up with a new regional bloc which might include everyone except India. “A greater South Asia is already emerging; this greater South Asia includes China, Iran, and the neighboring Central Asian republics,” says Pakistani Senator Mushahid Hussain Syed. The idea behind this pitch is to diversify the member states of a regional alliance which in turn would make sure that India is no longer able to entertain its hubris-driven designs in South Asia, which in itself is part of a bigger regional strategy. “There is a growing realization among the Asian stake holders, that resisting US interference in Asian affairs is a must if we are to materialize the dream of an Asian Century. Thus, the Asian big wigs need to form a block to create a multipolar world order. China and Pakistan's economic venture is the corner stone in this direction which integrates Russia as a muscle and Central Asia as a pathway for a new grand strategy,” Salman Javed, the director of the Center for Strategic & Contemporary Research in Islamabad, suggests. Capitalizing is exactly what China did when President Xi Jinping landed in Dacca, the capital of India’s ‘trusted ally’, Bangladesh, with a purse loaded with a whopping $24 billion in investments and loans for infrastructure projects in Bangladesh, something India simply cannot do. In other words, India might have been able to twist Bangladesh’s arm into boycotting the SAARC summit in Islamabad, but it has failed to stop the Chinese from economically pulling away their closest ally. Throw in the “String of Pearls” project, and you will have a very clear understanding of who is winning in South Asia, and this is clearly not India, for which China has to thank the New Delhi’s ultra-nationalist strategists for placing India in an irreversible disadvantage against China by deciding to sabotage SAARC. China and Pakistan will create a new regional economic bloc excluding India, which will prove to be a real existential threat for SAARC. CPEC will forge close partnership between China, Russia, Pakistan, Iran, and Central Asian countries through interconnectivity, energy and trade. India will be missing out on this due to its own US-influenced policies. Russia will seek a greater role in the Indian Ocean Region to challenge the US-Indian project to hegemonize it, which might also bring Moscow closer to Pakistan, Iran, and even some Gulf capitals. South Asian countries will continue to engage with China and Pakistan on bilateral terms, which could deny India the space it wants to occupy. A quadrilateral axis will form between China, Russia, Pakistan, and Iran to challenge US ambitions in Afghanistan as well as to bring stability to the region by joint efforts in fighting terrorism and separatism.